Place eggs in small saucepan and add enough cold water to cover eggs 1 inch. Heat to boiling over medium-high heat; reduce heat to medium-low and cook 10 minutes longer, adjusting heat as necessary to maintain a brisk simmer. With slotted spoon, transfer eggs to bowl filled with ice and cold water. Once cooled, peel eggs while submerged in water. Cut eggs lengthwise in half, and carefully remove yolks to medium bowl, keeping whites intact; reserve whites. Mash yolks with fork; stir in hummus, salt and pepper to taste and food coloring. Evenly divide hummus-mixture into the reserved whites. Put sliced black olives in the center of each egg. 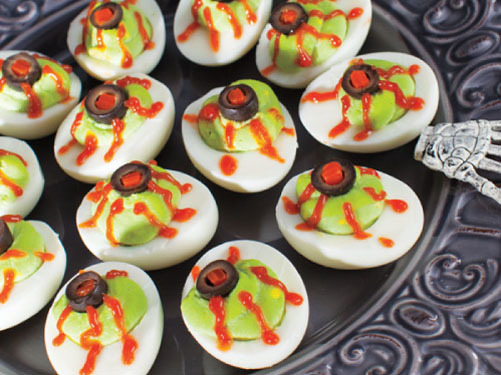 Use red gel icing to make the eyeballs appear bloodshot.